Christopher Gibbs, of Maplewood, was the first person to cast an absentee ballot Tuesday morning at the Shelby County Board of Elections. SIDNEY — For the first time in his voting history, Christopher Gibbs, of Maplewood, voted Tuesday, April 9, the first day absentee ballots could officially be cast. Gibbs’ relationship with the board of elections began around 2003 when he started working in the checking room on election night. Gibbs was appointed to the board of elections by the Republican Central Committee in 2007 after board member Ralph Bauer was appointed Shelby County prosecutor by the RCC. Bauer replaced James Stevenson who was elected Shelby County Common Pleas Court judge. Since his appointment to the board, he has seen many changes in the election procedures. “Changes on a weekly basis are not uncommon in the election administration business,” said Gibbs. “But for big sweeping change there is only one event that meets the test. And that began in Florida during the 2000 presidential race between George W. Bush and Al Gore where some Floridians couldn’t figure out how to read a ballot, let alone follow instructions. Punch cards and the related “chads” were no longer used by the local board of elections in 2005, he said. “In 2005, the board at the time made the decision to use the federal dollars available through the Help America Vote Act to purchase and begin using an optical scan system and paper ballots. They decided against touch screen voting,” said Gibbs. “Although I was not on the board at that time, I never miss a chance to tell what a wise decision that was. As our world has become more and more dependent on digital processes, we’ve become exponentially more vulnerable to cyber mischief. “Paper ballots are largely immune to that. Before I left, our board signed off on all new election equipment which will retain the paper ballots and optical scan equipment well into the next decade,” he said. In 2010-11, Gibbs became the chairperson of the board of elections. “There are two ways to handle chairmanships,” said Gibbs. “You can show up once a month, gavel in, call for votes and gavel out; or you can be an active 24/7 partner with the other members and staff. I always chose the latter. “In recent years, my fellow board members made that an easy choice because of their willingness to be an active ‘hands on’ board. Their focus always kept me hustling,” he said. Gibbs said there are three things he is most proud of during his term on the board of elections. “First, the working relationship with our existing board members. I’ve never served on a more focused and professional public board,” said Gibbs. “These gentlemen were tough. They never second guessed a decision once it was made and never shied away from a hard decision just because it was difficult. Gibbs said he’s also proud of the relationship between the board of elections and Shelby County Commissioners. Gibbs said there’s one piece of unfinished business remaining with the board of elections since he has left the board. “In the 2019 county budget, the commissions made a 5 percent pay adjustments were made available for all office holders and departments,” said Gibbs. “The allocations were to be made at the discretion of the elected official to allocate it the money to their staff. The board of elections approved a 3 percent increase in Kerrigan and Chupp’s salary and a $1 per hour increase for clerk Trina Riethman. “What we did, as the board of elections, was take a conservative approach and authorized the 3 percent pay adjustment for Donnie and Pam and $1 per hour increase for Trina,” said Gibbs. The board, said Gibbs, worked with the prosecutor’s office to update the board’s policy so it was the same one used by the county commissioners. “Because employees were not using overtime, but were using ‘off the books’ flex time, it was important to me to get everything above the board and defendable. Why is that important? We have employees who have to work mandatory hours for early voting, absentee voting 30 days prior to the election. The board employees are required to be there after the normal business hours until 7 p.m., on Saturdays and one Sunday prior to the election. “To be fair to the employees and to be responsible with the taxpayers dollars, the overtime police has to be followed,” he said. “The plan was to allocate 3 percent of the 5 percent made available to the staff in arrears to the last pay period in December. We wanted to go through the May election and see how much overtime usage their was. If the balance of 2 percent was still available, would would have allocated an additional pay adjustment after the May Primary. “Only a curmudgeon would deny good employees the adjustment when the dollars are available,” said Gibbs. Every board member, said Gibbs, has a few sleepless nights as they worry about an upcoming election. “Without question, what keeps election officials up at night is the fear of a close election, let alone a tie vote,” said Gibbs. “Unfortunately, no election goes off without a hitch which can and will move votes to one column or the other prior to the final election certification. It happens every time regardless of the best equipment, training or intentions. Even thought the next presidential election isn’t until 2020, Gibbs knows the current board of election members are already thinking about the May 2020 primary and November 2020 election. “Presidential elections are the super bowl for election administrators. All eyes are on every aspect of what BOEs do in a Presidential election,” said Gibbs.”Each major party will begin suing the Secretary of State to gain advantages for their ticket. BOE’s have to be ready for last minute changes to policy and be prepared to explain those changes to their local press and voters. “Beyond that, during any election, but particularly during a presidential election, administrators need to be prepared for a flood of opinions on how they can do their jobs better. Everybody will have one,” he said. “While I always welcomed ways to improve the process, it was rare when an individual or a group is really interested in good governance. Ninety-nine percent of the time their clamor for change is rooted in using the BOE to gain an advantage for their candidate, issue, or levy. I realize that’s a bit of a cynical view, but keeping it in mind will keep you out of trouble as a public official,” he said. Gibbs has a piece of advice for 17-year-olds getting ready to vote in their first election when they turn 18. “Learn your history, know what was sacrificed so you could vote, do your ‘do diligence’ in candidate and issue research, and embrace your right to vote like it was a gift from God,” said Gibbs. He also reminds the public that they have the right to interact with the board of elections members and to become involved with Election Day activities. “As with any public board, the members and staff are available to anyone. 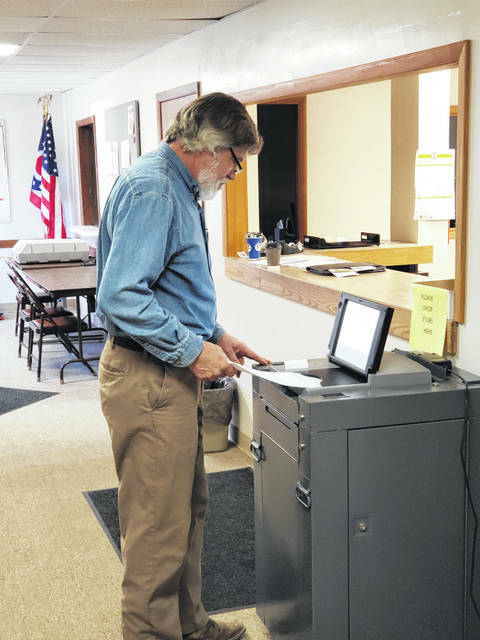 The best way to have a direct positive effect on the Shelby County election process is to sign up to be a precinct election official (poll worker),” he said. The job wasn’t without its frustrations, he said. One of the most frustrating parts includes the use of courts to carry out political agendas. He’s also frustrated with a small majority of people who believe it’s someone else’s responsibility to make sure they vote in an election. “While it’s a small percentage, there are plenty of voters out there who believe it is government’s, or more specifically, the BOE’s responsibility, to make sure they get to vote,” said Gibbs. “That couldn’t be further from the truth. The opportunity to vote is a right, and yes, you could even label it an entitlement. But the act of voting is one’s own personal responsibility. “In my view, it’s on the voter’s shoulders to know the voting day, the voting provisions, the eligibility criteria, the candidates, and the issues. Guess I was never was real big on hand holding and coddling. That’s not how I view good governance,” he said. Gibbs said he saw the “handwriting on the wall” prior to the appointment of James Kerg Jr. to the board of elections. Kerg replaced Gibbs on the board. Board member Jon Baker resigned in protest and Douglas Pence was appointed to fill Baker’s unexpired term. “No one responsible for BOE appointments has shared that (why he wasn’t reappointed) with me, nor should they be expected to,” said Gibbs. “I will say this – politics is a live by the sword, die by the sword game. These BOE appointments are, at the end of the day, political in nature. And that is by design. “By having both major parties represented in election administration, the public is assured that a check and balance system exists so that no one party runs off with the show,” he said.